We’d love your help. Let us know what’s wrong with this preview of Forbidden Royal by Victoria Pinder. Now, successful in her own right. She’s making strides in her career and meeting interesting people, but one client Political consultant Amy Fields only experienced jealousy once in her life, and that’s the way she’d like to keep it. Watching her older sister carry-on with the boy she absolutely adored in high school enough to make her never want to feel second-best again. To ask other readers questions about Forbidden Royal, please sign up. Forbidden Royal is the third book in the Princes of Avce series. While I haven’t read and followed along with every book in the series yet, I found this book to be exciting, romantic and filled with a touch of danger. The book is very fast paced and works well with the story told. I only felt that the mystery was rushed and not fully detailed enough for my understanding. Other than that I really enjoyed the story and look forward to reading the rest. Amy and Lucio knew each other in high school w Forbidden Royal is the third book in the Princes of Avce series. While I haven’t read and followed along with every book in the series yet, I found this book to be exciting, romantic and filled with a touch of danger. The book is very fast paced and works well with the story told. I only felt that the mystery was rushed and not fully detailed enough for my understanding. Other than that I really enjoyed the story and look forward to reading the rest. Amy and Lucio knew each other in high school when Lucio dated her sister. Now that Lucio is nearing thirty years old he is counting down the days when he will get exiled from his family if he doesn’t marry. When an IT department comes up with Amy to be his perfect match, Lucio hopes to woo her into marrying him. Amy has a lot of pressure coming from family and while she thinks it over, the two are faced with a danger and a betrayal from a friend. Will they survive to find true love? I would recommend this book to those who enjoy romantic suspense. Prince Lucio Aussa of Avce needs to be married by age 30 or be banished, according to Avce custom. When Lucio learns his prospective bride is Amy Fields, he decides to meet her face-to-face to decide if she's the one for him. Political analyst Amy Field used to stare at her sister Evie's high school boyfriend Lucio with longing, wishing he'd notice her. Amy is surprised when Lucio shows up out of the blue years later and asks her to marry him. Amy agrees to marry Lucio because Evie hates the ide Prince Lucio Aussa of Avce needs to be married by age 30 or be banished, according to Avce custom. When Lucio learns his prospective bride is Amy Fields, he decides to meet her face-to-face to decide if she's the one for him. Political analyst Amy Field used to stare at her sister Evie's high school boyfriend Lucio with longing, wishing he'd notice her. Amy is surprised when Lucio shows up out of the blue years later and asks her to marry him. Amy agrees to marry Lucio because Evie hates the idea and her parents will never leave her alone if she doesn't. Lucio takes Amy back to Avce and as they get to know each other, Lucio is determined to show Amy how good they are together because he never wants to let her go. Amy may crushed on Lucio years ago and now he's stealing her heart but does she have his heart? Before Amy has a chance to find out, she gets kidnapped. Will Amy and Lucio get their HEA? The story of the Princes of Avce continues in this third book of the series with the third brother needing to find a wife before his thirtieth birthday in just under one years’ time. If you have read the other books in the series you will know about the families rule that all male heirs must marry by their 30th birthday or forgo their family, title, and money. If you have not read any other books that is fine as you can read any of these as a stand-alone read? Each book has drama, suspense, good The story of the Princes of Avce continues in this third book of the series with the third brother needing to find a wife before his thirtieth birthday in just under one years’ time. If you have read the other books in the series you will know about the families rule that all male heirs must marry by their 30th birthday or forgo their family, title, and money. If you have not read any other books that is fine as you can read any of these as a stand-alone read? Each book has drama, suspense, good verse evil and many hearts to fall in love. I love Victoria Pinder’s writing style and wonderful characters she brings to life in the pages of her books. This is my voluntary and honest review of this book that I have been given and would recommend this author to any romance reader that loves a bit of everything in their books. Oh, Lucio… A two week plan of seduction, when you don’t even speak the same ‘language’? This should be good. But then, the language of love has its own lexicon, doesn’t it? If her heart can hear yours, what do you suppose might happen? One thing I found enjoyable about this book is the author’s way of adding small, poetic nuances to the thoughts of the characters, and to everyday events. It moves the narrative o Oh, Lucio… A two week plan of seduction, when you don’t even speak the same ‘language’? This should be good. One thing I found enjoyable about this book is the author’s way of adding small, poetic nuances to the thoughts of the characters, and to everyday events. It moves the narrative out of the mundane and into something worth pondering over. These little surprises along the way are like small gifts, and it made me love the book even more. Bottom line: The best yet in this series. But I enjoyed them all. 5 stars. I received an ARC of this book with no expectation of a "good" review. This is the first book in the series that I have read (will be going back to read the others). I really enjoyed the story. There was a lot of suspense and a few surprises. I felt that the characters were well developed (as well as you can do for a short book) and enjoyed the banter between them. I was however surprised at the ending (not going to spoil it for you). I would definitely LOVE to see this book drawn out a bit more I received an ARC of this book with no expectation of a "good" review. This book was absolute awesome! I'm just getting ready for the couple of this story, Passionate, Drama, Sexual, Dangerous, all in writing this story about how Royals, learn how to make sure that they married the right woman who has everything that they need in their families. Exciting times ahead with dangerous people who want to destroy their families! The author has done a terrific job in writing this story.Enjoy!!! Most of the way thru it I was thinking this is about a 2.5 star book. I can’t really pinpoint why.. it just felt clunky, I didn’t really ‘feel’ the connection between the pair. The ending redeemed the book slightly, but not quite enough for me to fully commit to a 3 stars. If you are a sucker for romantic royal fairytales which are have clean language and love scenes then this is for you. I am loving this series and how it focuses on a couple and their story. This is a great series with wonderful characters that you come to really like and find yourself rooting for them to get their HEA. I really liked that there was more to this read them your average romance and it had some espionage and a little terrorist activities that mixed really well with the story. I cant wait to read the other books to come in this series. I love this series about the Princes of Avce. Someone or several someone's don't want the marriage of Lucio and Amy to take place. Could it be her sister who was Lucio's girlfriend in high school or a conspiracy to overthrow the royals. It combines danger, betrayal of the unexpected, a rescue and falling in love with the woman a computer pairs you up with to be your wife. I received a complimentary copy and I am voluntarily reviewing. As I read this series, the Princes of Avce, I find more of the same. Insta-love, a touch of political intrigue with a smattering of fam ill my issues on behalf of the h.
The stories do not draw me in so much as to entertain and, at least so far they end at the wedding which in this case is annoying. After all, that is what the basis for having a story is about. I would have hoped that basis would change to the characters along the way. The Royal IT matchmaking program revealed to Lucio that his ex girlfriend Evie's sister Amy is his true match. So off tge prince goes to get his bide. Danger looks from an unknown corner and threatens this royal match.A cast of characters you will recognise in yourr daily life. This is the third books and is its time for Leo to find his princess. When he used the same program as his brothers it came up with the name of the younger sister of the girl he dated in high school. Amy was a nice girl and she had a crush on Leo when she was younger until her sister stepped in and took him. Now as adults can they make it work. 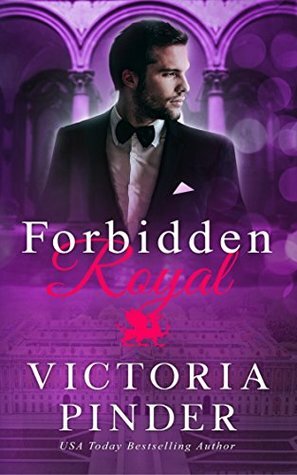 Forbidden Royal (The Avce Royals #3), the third in a new series from author Victoria Pinder, the best so far! A romantic suspense heavy on suspense & intrigue. A good well-written read, I went through it in a matter of hours. I will be reading more by Victoria Pinder and look forward to the fourth book in the series. This is the third book in the Princes of Avce series and I enjoyed them all. This is a love story full of mystery, suspense, drama, danger and romance. It has some interesting and complex characters. A little spark, chemistry and a second chance at high school attraction makes it interesting. The story is well written and the intrigue and action will keep you reading to the very last page. A second chance romance that I enjoyed reading from cover to cover. A well-written story that drew me into the book. The book has intrigue, kidnapping, suspense, and danger for Lucio and Amy. I received a copy of this book and I am voluntarily leaving a review. I really enjoyed this one. It's a good almost second chance story, political intrigue and suspense thrown in for good measure. I loved Amy and Lucio. Great read. I voluntarily received an ARC of this book. Superb as always. Amy is a political consultant, doing well for herself. Only once, was she jealous and in her mind that’s the last time. A fast paced romantic book that’s impossible to put down. Received a free copy. Don’t miss out when it’s released. Very entertaining, captivating, and interesting read. I could not put it down. Wonderfully written with strong characters. I want to read more from this author. I voluntarily read and reviewed an Advance Reader Copy of this book. What little girl doesn't dream of marrying a prince some day? Really great story. Lots of twists and turns, bad guys and threats against the marriage, even a kidnapping thrown in! The storyline is fine but I feel disconnected with the characters. It feels like reading one event after another with just the facts. I don’t know if it is because they are royals and should not show emotions but I am not moved by the characters. The plotline has some twists, is unique and wellwritten. I enjoyed reading the book and therefore looking forward to more Royal-Tales from the author. So go ahead, grab a cup of coffee, grab this book and let it's magic give You a relaxing reading time. I'd love for a prince to lead me into a false interview, I would marry him in a New York minute. I wonderful story which could happen in real life furniture Royal bit. Amy has been in love the Lucio since she was a teenager. A very enjoyable read with well developed characters. I read an ARC and this voluntary review is my own opinion. Victoria Pinder grew up in Irish Catholic Boston before moving to the Miami sun. She’s worked in engineering, after passing many tests proving how easy Math came to her. Then hating her life at the age of twenty four, she decided to go to law school. Four years later, after passing the bar and practicing very little, she realized that she hates the practice of law. She refused to one day turn 50 a Victoria Pinder grew up in Irish Catholic Boston before moving to the Miami sun. She’s worked in engineering, after passing many tests proving how easy Math came to her. Then hating her life at the age of twenty four, she decided to go to law school. Four years later, after passing the bar and practicing very little, she realized that she hates the practice of law. She refused to one day turn 50 and realize she had nothing but her career and hours at a desk. After realizing she needed change, she became a high school teacher. Teaching is rewarding, but writing is a passion. Also she’s the Vice President of Progams for the Florida Romance Writers. She’s gone to multiple conferences and intends to continue. She learns and meets so many people at conferences. Her website is here, www.victoriapinder.com, and she’ll continue to grow my web presence. She is working hard on other projects and found the time to plan her wedding this year.